CELABOR at the 4th edition of "Green chemistry and White biotechnology: from research to business"
This May 23-24th, GreenWin hosted the 4th Edition of International Conference Green chemistry and White biotechnology: from research to business. 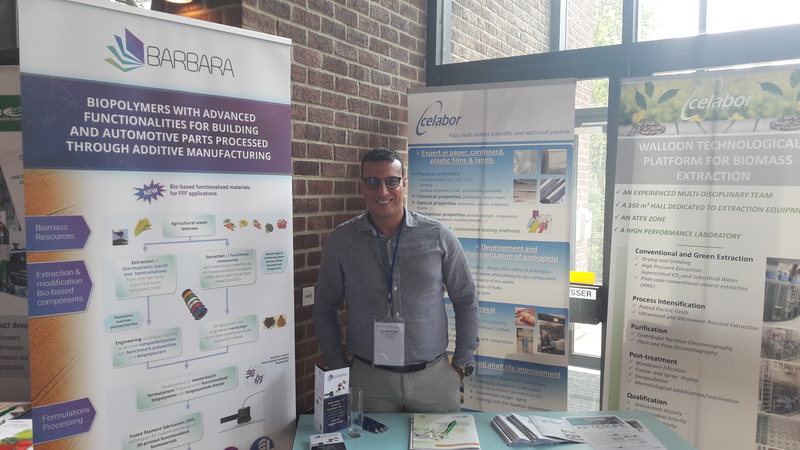 On this edition, CELABOR, valuable company within the consortium, was not only a participant (poster), but also a sponsor of the event, having a whole exhibitor stand, where the BARBARA project was presented, along with the many other activities of the company. Dr. Farouk Ayadi was in charge of the dissemination of the actvities at CELABOR. In partnership with the University of Louvain-la-Neuve, the purpose of the conference was to take stock of the innovative technology used to boost activities in the fields of green chemistry and white biotechnology around the world, to share knowledge and encourage the creation of new R&D projects involving the academic world, research centres and industrial players in the sector. Check out our latest updates on the BARBARA project and other related activities by subscribing to our newsletter and follow us on facebook, twitter and linkedin !! !